US President Barack Obama ended a landmark day in India on Monday with a pledge of $4 billion in investments and loans, seeking to release what he called the "untapped potential" of a business and strategic partnership between the world's largest democracies. 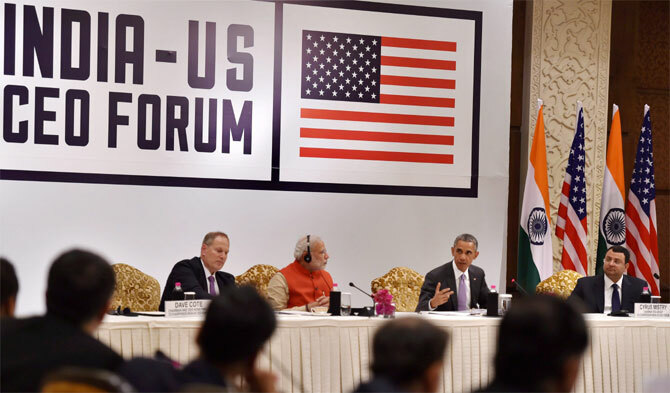 India only accounts for 2 per cent of US imports and one percent of its exports, Obama said. While annual bilateral trade had reached $100 billion, that is less than a fifth of US trade with India's neighbour, China. The United States views India as a vast market and potential counterweight in Asia to a more assertive China, but has frequently been frustrated with the slow pace of New Delhi's economic reforms and unwillingness to side with Washington in international affairs. That may be changing under Modi, who has injected a new vitality into the economy and foreign relations since his May elections, and to Washington's delight, has begun pushing back against China across Asia.